courage to keep her life from fading. Wow. This book blew me away. It was raw and vivid, I totally felt all the poignant emotions this book evoked: brokenness, fear, pain, heartbreak, insecurity and hopelessness. E.K. 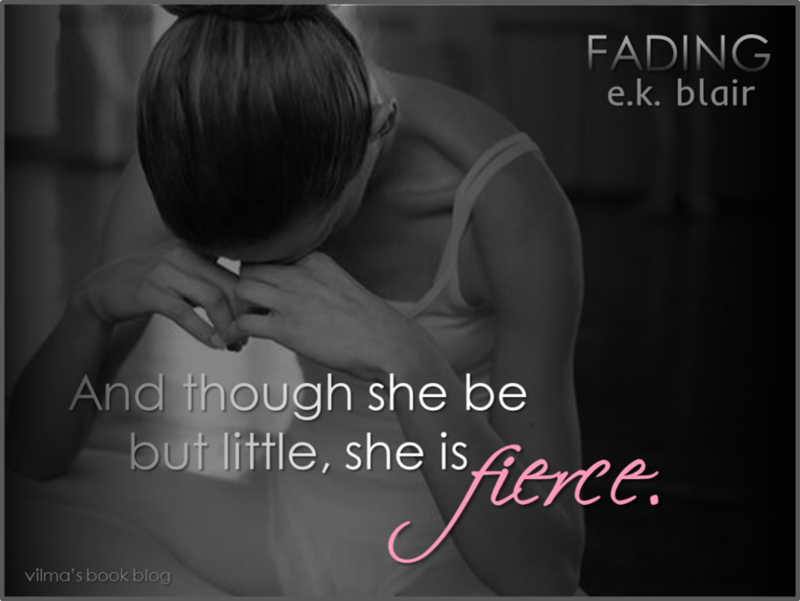 Blair’s writing is smooth and gripping and I was lost in feeling Candace’s painful story. The emotions were so palpable and believable. This is a beautiful story about finding the courage inside to overcome something so scarring and harrowing that you feel your life begins to fade into darkness. But with love, finding light… finding hope… finding happiness is possible. 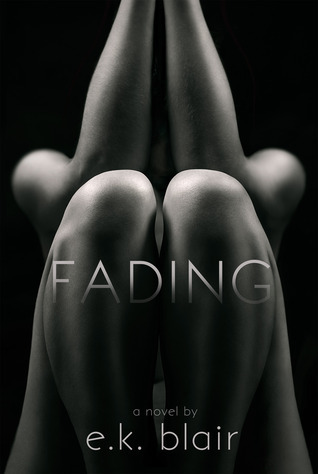 One of the other amazing things about this book that I wanted to remark on is its title… the concept of fading is so ingenious. 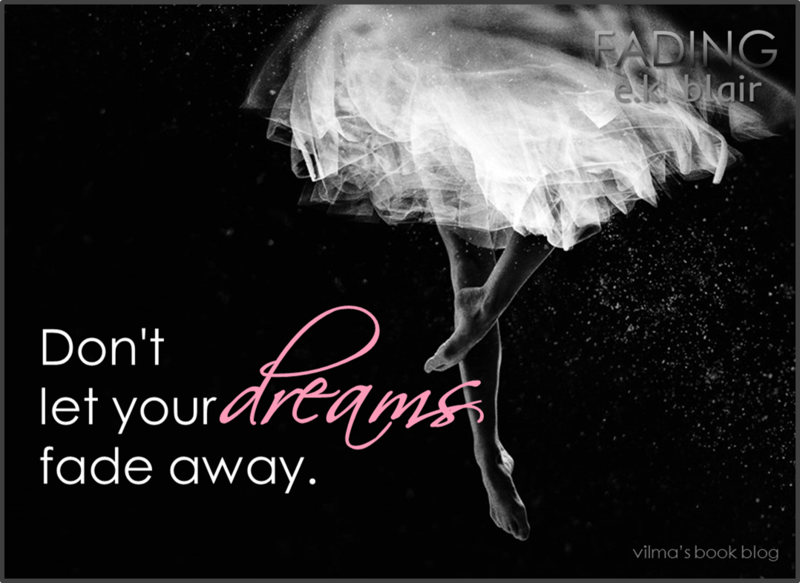 Fading dreams. 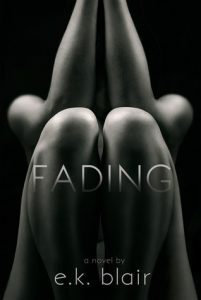 Fading feelings. Fading friendships. Fading light. Even fading distractions to find focus on what matters most. It’s about what once was and is no longer and in its place a new life free of all the darkness. Candace Parker was a good girl… 4.0 GPA and dedicated to her passion for ballet dancing. She comes from a wealthy household, but doesn’t have the support of her parents. Her mother constantly berates her by telling her she’s a disappointment all while dismissing her desire to dance professionally. She insists she needs to play the part of a high society daughter and insists she thinking about finding herself a respectable husband. But one day, just as she is trying to push herself to have a little fun, to try and be different than who she is, tragedy befalls, marring her life in a way she can never erase. I’ll tell you right up front, reading through what happens is difficult… it’s not overly graphic, but it’s real and raw and horrible. I felt breathless and verklempt as I read through it, still reeling from the shock of it. What happens consumes her wholly, the memories taking hold of her thoughts unceasingly, her perceived guilt crushing her so much that she can’t seem to recover. As time progresses, she is a shell of what she used to be and it seems so hopeless and unlikely that she can once again be happy and at peace. What is really amazing about this book is that every word is full of purpose. The pacing of the story is a natural and realistic alignment to what Candace goes through. It’s slow and methodical and nothing felt rushed because when something like this really happens, it tears you open to the core. Finding yourself out through the darkness and the fear happens with the tiniest of steps. When Ryan Campbell comes along, he becomes a friend… someone that slowly begins to pull her through the darkness. He encourages her to talk to him, to lean on him while he provides unwavering support. Ryan is so patient and caring that he begins to break down the walls Candace so solidly erected to avoid getting hurt again. But they fall in love so beautifully and he saves her, in essence, through his love. The range of feelings explored in this book are vast. Sometimes the smallest of triggers can send Candace back into herself and it’s just heartbreaking to read through. I felt shock, anger, heartbreak, sadness, love and hope. There is so much to experience. In addition, there are elements so complicated and connected that become secrets with the capability to destroy. It’s unbelievable that this is E.K. Blair’s debut novel. It’s so thoughtful and well written, eliciting so much feeling that it has you connecting with the story and its characters on a very deep level. In the end, it does have a happy ending that left me feeling happy and hopeful. For me, Fading is a beautifully crafted story of love, hope and courage that I won’t soon forget. There are two more books planned in the series. Freeing is Jase’s story (a novella) and will be out in September. Falling, Ryan’s story, will release in December. One very important aspect to know is that these are not simply POV stories, they are completely new experiences with only some pivotal scenes revisited. Absolutely Loved this book and am so looking forward to reading the next two!! A totally emotional read…loved every word on every page!